One of the eldest and most traditional economic activities, retail has largely remained the same throughout the centuries. The emerging competition of online shopping, however, is pushing brick-and-mortar retailers towards innovation. The present article will discuss new technologies that promise to revolutionize the retail sector. It will further present the R&D tax credit opportunity available for innovative retailers. E-retail is the most dangerous threat to brick-and-mortar stores. According to a Forrester Research forecast, U.S. online retail sales are expected to grow from $263 billion in 2013 to $414 billion in 2018, a compound annual growth rate of 9.5 percent. As people become more comfortable with shopping on mobile phones and tablets, e-commerce’s share of total retail sales promises to grow even further. Even more so as young generations, the “digital natives”, become economically active. E-commerce offers convenience, discretion, speed, and access to a wide variety of products. On top of that, online retailers adopt aggressive marketing, pricing, and customer acquisition tactics that attract a growing number of shoppers. In order to counter this fearless competition, traditional retailers must rethink the way they do business. In fact, a growing number of retailers are engaged in creatively applying new technologies to enhance the in-store shopping experience, attracting new customers and maintaining old ones. This renewed retail sector is marked by greater innovation, integration, and responsiveness. Robots, beacons, and mobile payments are just a few examples among many other innovative technologies that promise to change the face of retail. Some of America’s largest retailers are investing in their own innovation labs. The following table presents six of such initiatives. Within the past year, Walmart Labs has hired 1,000 workers, employing a total of 3,500 people, and has acquired 14 startups. The laboratory has created Walmart Exchange, a platform available to brands that sell products at Walmart, which allows for real time ads based on shopper data. Among the mobile apps developed at Walmart Labs is the Savings Catcher, which scans a receipt to find prices at competing stores. If the app finds a cheaper price, shoppers get money back in the form of a gift card. Improving mobile commerce capabilities is among Staples priorities. The retailer recently deployed a new application using Apple Pay and launched Visa Checkout, which saves credit card information within its mobile app in order to speed up the checkout process. The personalization of the shopping experience, the development of highly functional in-store kiosks, and the integration of cutting-edge technology, such as 3D printing, are also ongoing efforts. Lowe’s Innovation Labs have spun out two projects so far: 1) the Holoroom project uses installations and an augmented reality app to create virtual replicas of home improvement projects; 2) the self-roaming OSHbot sheds light on how retailers can take advantage of robotics. Westfield Labs recently announced the Bespoke project, which will devote 40,000 square feet to retail tech demonstrations. The goal is to rethink how traditional retailers operate in Westfield Group's shopping centers across the globe. In partnership with eBay, the laboratory has set up three 10-foot tall shoppable screens at its San Francisco location. The devices allow shoppers to swipe through products and then buy them from a mobile device. Formerly known as BlackLocus, Home Depot’s Innovation Lab is working on next-generation business software for retailers, as well as new and improved ways to use complex data sets in the retail environment. Working in close collaboration with tech startups, Target’s Innovation Lab focuses on four areas: virtual reality, robotics, Internet of Things, and digital activations. Ongoing projects include a 3D, virtual reality experience to furnish a dorm room and the use of beacons and location technologies. Emerging as a new paradigm in indoor communication, beacons are low-cost, low-powered transmitters that connect with smart devices via in-built Bluetooth Low Energy (BLE) technology. When in proximity with such devices, beacons trigger activity in mobile applications, allowing them to understand their position on a micro-local scale level and to pull specific, context-oriented data from the web, based on location. A unique indoor marketing technology, beacons have the potential to revolutionize the shopping experience. In-store applications include targeted notifications based on consumers’ location in the shop, which can consist of product details, flash sales or deals, and helpful information. Beacons can also be used for offline payments. When integrated with a store’s point-of-sale data, they can speed up the checkout process by enabling hands-free, mobile payments. By saving time and effort this contactless payment system could significantly increase sales. Off-line payments, much like the ones we make on websites, can provide retailers with information on consumers’ preferences and allow for follow-ups and recommendations of future purchases. This technology gives in-store transactions the same data sophistication of digital ones, opening the way for Big Data analytics. Silicon Valley-based Shopkick was one of the first companies to implement beacon technology in retail settings. Among its most important clients is Macy’s, which, after a test run at its flagship stores in New York City and San Francisco, announced plans to use more than 4,000 ShopBeacons in all its stores nationwide. Headquartered in Mooresville, North Carolina, Lowe’s Companies operates a chain of over 1,835 retail home improvement and appliance stores in the U.S., Canada, and Mexico. The Fortune 100 company, which serves approximately 15 million customers a week, is an iconic example of retail innovation. In partnership with Fellow Robots, a Silicon Valley technology startup, Lowe’s Innovation Labs developed OSHbot, the first retail robot of its kind in the U.S. Enabled with natural language processing technology, the robotic shopping assistant greets customers and asks if they need help – a dialogue that can be established both in English and Spanish. Then, it uses autonomous navigation capabilities to guide consumers through the store, directing them to the requested products – all while ensuring safety through a collision avoidance mechanism. OSHbots are equipped with a 3D sensing camera, which allows customers to scan objects in order to obtain information. This can be particularly helpful for people looking to match certain-size nail or hinge, for example. Moreover, the 5-foot tall robots feature two large screens for videoconferences with store experts and in-store advertising displays. 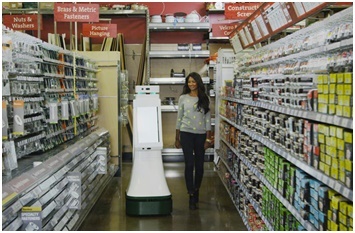 Recently introduced at an Orchard Supply hardware store in San Jose, California, the revolutionary retail robots promise to bring some of the benefits of e-commerce to physical stores, particularly when it comes to convenience and access to information. OSHbots are an interesting example of how retailers can take advantage of robotics. As the technology matures and becomes more affordable, retail robots should become increasingly mainstream. In Cybersecurity is one of the most serious economic and security challenges currently facing the nation. Retailers are particularly exposed to this threat, as proved by the recent multiplication of high-profile data breaches. Home Depot, Target, and the Neiman Marcus Group are a few examples of the magnitude of the ongoing menace. The breaches of credit and debit card information amounted to 56 million cards over a period of five months in the case of Home Depot and approximately 40 million in the case of Target. The technique used in both breaches is called “skimming” and consists in using software to grab data as it comes in. Vulnerability to cyberattacks shatters retailers’ credibility, undermining their relationship with clients. Effective cyber security technology is increasingly central not only for the protection of sensitive data, but also for the preservation of customers’ confidence. According to IT research and advisory firm Gartner, retailers spend remarkably little on cybersecurity – an average of 4 percent of their IT budgets. A June 2014 report by PricewaterhouseCoopers pointed out that while the banking and financial industries spend as much as $2,500 per employee on cybersecurity, retail and consumer products companies invest only about $400. Technical Assessment: Figure out where the company stands technically and identify current threats. Incident Preparation: Plan incident response before it strikes. Multiple Walls of Defense: Implement end-to-end encryption and tokenization in existing payment systems. Create a multi-layered system that combines management tools, antivirus software, firewalls, threat detection, filters, and hashing. Attackers are often highly sophisticated and capable of finding ways around even the most complex defense mechanisms. Their ability to quickly adapt stresses the importance of continued innovation in retail cybersecurity technology. Created in March 2014, the Retail Cyber Intelligence Sharing Center (R-CISC) brings together over 50 retailers. In addition to engaging in multiple research and development efforts, the R-CISC has established a Retail Information Sharing & Analysis Center (ISAC), a forum for retailers to share threat information and leading practices. Information such as the specific attributes defining known or suspected threat activities, and the tactics, techniques, or procedures of a particular threat are processed and distilled by a staff of dedicated analysts. This collaboration helps identify new strains of malware, underground criminal forum activity, or potential software vulnerabilities. Collaboration between the retail and financial services industry should also contribute to enhanced security. One example of such collaboration will be the advancement of EMV chip technology in the U.S. Largely adopted in Europe, it uses a PIN and cryptographic algorithms for authentication, a process that significantly reduces the risk of fraud. As from October 2015, retailers who don’t update systems and hardware to read chipped cards will be liable for fraudulent transactions associated with swipe cards. Cybersecurity is no longer a mere IT problem. It is a business risk. The estimated cost of tackling Target’s breach, for instance, surpassed $60 million. The economic loss comes together with a reputational damage, which can have serious long-term consequences. For these reasons, investing in innovative cybersecurity technology must be a top priority for retailers. Radio Frequency Identification (RFID) consists in a wireless exchange of information between a tagged object and a reader/writer. Its primary objective is to identify and distinguish items that communicate via radio waves. RFID serves as a bridge between the physical world and the digital world, as it allows physical objects to be recognized and differentiated by computers. The combination of an RFID chip and an antenna is called RFID tag, or transponder. Different from barcodes, which must be read one at a time and require a direct line of sight with readers, RFID tags offer flexibility of placement and range in relation to readers. RFID is an alternative when other data collecting technologies or manual labor are impractical or impossible. RFID tags can hold various sorts of information, such as serial numbers, configuration instructions, and activity history. Tags can also be connected to sensors in order to capture and record variable information. Improved technology performance and falling implementation costs have led to a widespread adoption of RFID solutions across various industries. They are used to monitor processes, track assets and inventory, and reduce labor requirement. The retail industry, in particular, increasingly uses RFID labels as an intelligent alternative for data storage, display, and transmission. The use of RFID technology for item-level tagging has doubled every year since 2008. The so-called “smart labels” combine human-readable information and barcode technology with RFID. They consist of adhesive labels that are embedded with ultra-thin RFID tag "inlays", offering the read range and unattended processing capabilities of RFID while maintaining the convenience of on-demand label printing. The tag inlay can be encoded with fixed or variable data. Major retailers, such as Walmart, JC Penney, and Macy’s have implemented RFID item-level tagging to handle inventory, preventing out of stock situations. Many have adopted the “live inventory technology”, which consists of an on-going automatic RFID scan system in warehouses and stores that provides real-time detailed information on stocked products. Another potential use of RFID tags in retail is a simultaneous, “one shot” checkout. All items chosen by a customer can be scanned at once, no need to remove them from the cart. Mobile payments generally refer to financial transactions performed from or via a mobile device. A growing number of financial institutions, credit card companies, as well as Internet and mobile communication companies have implemented mobile payment solutions. Save money on credit card fees – at times, mobile payment companies charge less per transaction than credit card ones, generating direct savings for retailers. Increase consumer confidence – many mobile payment solutions keep personal data in their own systems, without the need to share it with retailers. This can inspire customers’ confidence, particularly after recent high-profile data breaches. According to management consulting firm Bain & Company, nearly twice as many consumers started using mobile payments in 2013 as they did in 2012. 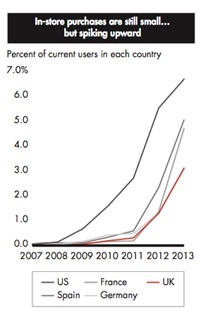 Even though the in-store use of this technology is still small, recent growth has been remarkable. PayPal, Google Wallet, and the recently launched Apple Pay are three of the big names in mobile payment technology. In an effort to increase awareness of this alternative payment method, they have established mutually beneficial partnerships with retailers to offer deals and discounts. Even though the use of third party mobile payment applications has been the rule, innovative retailers are beginning to play a bigger part in this emerging market. Some argue that retailers might even have competitive advantage in this area due to the popularity of their existing apps and to their unique ability of creating a better shopping experience. One example is the Merchant Customer Exchange, a consortium formed by the nation’s leading merchants to develop a customer-centric and secure mobile payment solution. With regional and national rollouts planned for 2015, CurrentC is expected to simplify, enhance, and secure customers’ shopping experiences in over 110,000 merchant locations. There is still debate whether the mobile payment solution will use QR code technology, which acts like a scannable bar code, or Near Field Communication, which involves the establishment of radio communication between two devices placed in close proximity. Faced with fierce competition from online commerce, brick-and-mortar retailers must use innovation to improve the shopping experience. Robots, mobile payments, radio frequency identification, and beacons are examples of emerging solutions that can potentially revolutionize the retail industry. Federal R&D tax credits are available to support innovative retailers in their efforts to remain competitive.